Divided the building into three part system in order the show the varying structural assemblies. Starting in the Center we slowly peal off the layers and expose each components. The Project is consists of 10 buildings with shell like appearances. There are three different sizes of buildings. We modeled the largest building type to a 1:75 Scale. By using varying drawings from researching we were able to construct plans and sections of the building we needed. The largest shell that we modeled after is consisted of total 29 members. In order to create a perfectly symmetrical shell the members mirror each other starting from the most centered columns. Cross section/plan, elevation (back), section/elevation of Jean-Marie Tjibaou cultural centre. After analysis and studies, the plan at the bottom was drawn for model making. The Detail: After studying the books and images, we were capable of figuring out the detail structural connections of the column members as well. The Lamination of the Structure: We divided the building into three part system in order the show the varying structural assemblies. Starting in the Center we slowly peal off the layers and expose each components. The largest shell that we modeled after is consisted of total 29 members. In order to create a perfectly symmetrical shell the members mirror each other starting from the most centered columns. Using those files we created all of the assembly components. The next steps were to prepare all the the joint members by cutting the three different thicknesses of piano wires to the correct length. Due to the curvature of the outside member the lenth of lateral pieces gradually increased and decreased. Therefore, calculating that ratio was crucial as well. Then we fitted the wooden columns to the column base. We specifically chose plexi glass in order to show how the foundation slab and the columns assembled together. After fitting the wood members into the plexi plate, we started with putting lateral bracing members into the holes of the wooden members in order to stabilize the structure. Continuation of the assemblage of the straight lateral bracing members. Final assemblage of the lateral bracing member. After straight lateral members were stabilized, and cross bracing members were added. The cross bracing strengthens the structural stability between the curved column and the straight column. Once all of the lateral bracing was completed, both straight and cross members, we added diagonal bracing on the front facade of the building in order to help transfer all the vertical load down to the foundation. To show the relationship between the architecture and the actual structure, we also added some layers of the architectural skin (wooden louvers) in the middle sections. As we pealed the architectural skin, we revealed the varying structural pieces within the building. Final model. 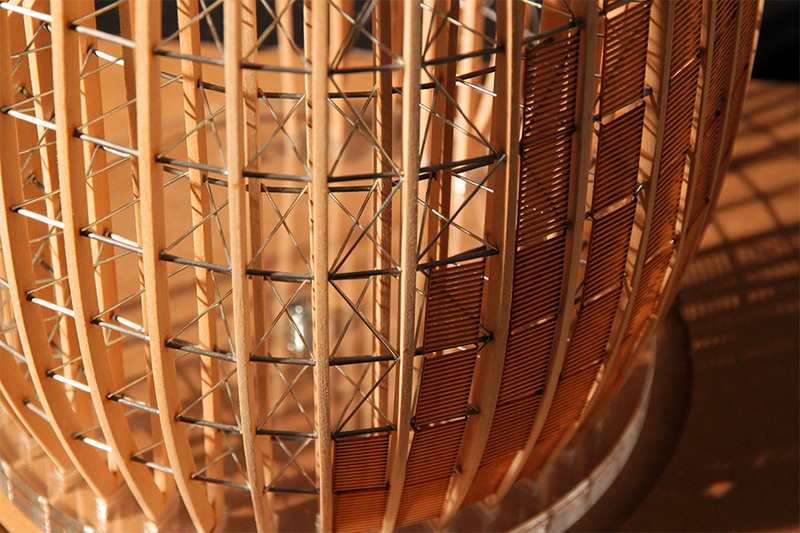 ctural skin (wooden louvers) in the middle sections. As we pealed the architectural skin, we revealed the varying structural pieces within the building.